We’ll provide some insights and review some of our value DFS defense picks for week 11. Denver Broncos – Salaries: DraftKings (DK) – 2000, FanDuel (FD) – 3300. The Broncos’ salary ranks them 25th/20th on DK/FD, respectively. The betting line with the Chargers has the game total at 47 points with the Broncos as +7 point road dogs. The Chargers’ implied team total is currently at 27 points and the Broncos are currently at 20 points. The Broncos are coming off their bye. The Chargers rank 8th in fantasy points allowed to opposing defenses, give up the 4th fewest sacks at 13, and allow the fewest turnovers (tied) with 7. Last week, the Raiders’ defense logged 1sack, 1 pick, and held the Chargers to 20 points for 4 fantasy points. The Raiders’ defense ranks last with 2.22 fantasy points/gm. The Broncos’ defense ranks 8th in fantasy points scoring, 7th (tied) in sacks with 28, and 13th (tied) in interceptions with 8. The Broncos’ defense also had to contend with the offenses of Kansas City (twice), Rams, and the Texans thus far. The matchup is tough, but this should be in reality a “home” game for Denver, as is typically the case for opposing teams at the StubHub Center. If the lowly Raiders can manage 4 points, Denver’s defense should consider this their floor. If punting the position this week at this price point, you could probably do worse. Green Bay Packers – Salaries: DraftKings (DK) – 2300, FanDuel (FD) – 3700. The Packers’ salary ranks them 15th/10th on DK/FD, respectively. The betting line with the Seahawks has the game total at 49 points with the Packers as +2.5 point road dogs on Thursday night. The Seahawks’ implied team total is currently at 25.75 points and the Packers are currently at 23.25 points. The Seahawks rank 17th in fantasy points allowed to opposing defenses while the Packers’ defense ranks 9th in fantasy points/gm. Seattle allows the 7th (tied) most sacks with 29 and Green Bay ranks 1st (tied) in sacks with 31. The Rams’ defense managed 4 sacks and a fumble recovery but allowed 31 points to the Seahawks last week. The Packers’ defense logged 6 sacks, a pick, a fumble recovery, and held the Dolphins to 12 points, earning them 14 fantasy points, ranking them 3rd last week. This game could turn into a slugfest, but the Packers have a pathway to success as they can bring pressure, and Seattle allows it. 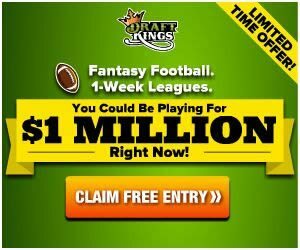 Pittsburgh Steelers – Salaries: DraftKings (DK) – 2900, FanDuel (FD) – 3800. The Steelers’ salary ranks them 4th/8th on DK/FD, respectively. The betting line with the Jaguars has the game total at 47 points with the Steelers as -5.5 point road favorites. The Jaguars’ implied team total is currently at 20.75 points and the Steelers are currently at 26.25 points. The Jaguars’ offense gives up the 7th most fantasy points to opposing defenses and the 5th (tied) most turnovers with 19. This offense also ranks 29th in points per game with 17.8. The Steelers’ defense ranks 5th in fantasy points per game, 1st (tied) in sacks with 31, 2nd in QB hits with 69, and 19th (tied) in turnovers created with 11. The Steelers’ defense racked up 5 sacks, a pick-six, and a fumble recovery against the Panthers last week. Going into a long week, the Steelers are turning it on in all facets, as they are riding a five-game win streak as the AFC North leader. The Jags, however, are on a five-game losing streak, and are on the verge of implosion, as the AFC South cellar-dwellers. During this span, the Jags are giving up an avg. of 11.6 fantasy points to defenses, while the Steelers defense have averaged 9 fantasy points/gm. If this one gets out of hand early, Bortles and co. get be in for a very long day. Arizona Cardinals – Salaries: DraftKings (DK) – 3100, FanDuel (FD) – 4000. The Cardinals’ salary ranks them 3rd/5th on DK/FD, respectively. The betting line with the Raiders has the game total at 40.5 points (lowest on the board) with the Cardinals as -4 point home favorites. The Raiders’ implied team total is currently at 18.25 points and the Cardinals are currently at 22.25 points. The Raiders’ offense gives up the 4th most fantasy points to opposing defenses, the 7th (tied) most sacks with 29, and rank 30th in scoring with 16.3 points/gm. The Chargers’ defense recorded 4 sacks, a fumble recovery, and held the Raiders to 6 points last week. The Cards’ defense ranks 11th in fantasy points/gm and 6th in sacks with 29. The Cardinals logged 5 sacks at Kansas City last week. The Raiders are currently on pace for the #1 pick in April’s draft, which must please Gruden to no end. The Cards have multiple pathways to success with big potential upside in this positive script matchup.